[Knife141] lets this monkey push him around all day long. It’s a whimsical touch for his scratch-built electric scooter. He started the build without a set of plans, cutting angle iron and clamping it together until the frame looked about right. Once the welding was done, he began adding all the parts to make it functional. There are front and rear brakes, operated by a lever on the handlebars. The rear wheel has a sprocket bolted to it, along with some spacers to give the chain adequate clearance. Inside the saddle enclosure you’ll find a set of three lead-acid batteries. These are 12 volt 10 amp models that provide 36 volts of juice to the electric motor. The only thing we know about the electronics is that both the motor and the controller were purchased at a surplus store. 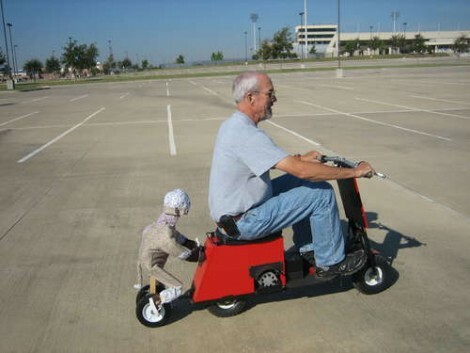 The sock monkey that pushes him around is sort of an afterthought. But since it’s just a couple of wheels with the feet attached, this might make a fun project for the kids to add to a bike. Similarly, I’ve seen a lawn tractor “pulling” a much larger tractor in a parade. Actually the links in the “tow chain” were welded stiff and the large tractor was pushing the smaller tractor. what’s the range before that monkey get’s tired? Ditch the monkey. It’s creepy and makes the project look like a joke. I agree. Either make the monkey on a unicycle or find a way to remove the wheels from under it.